Did you know that you may be able to relieve pain and treat various health conditions simply by applying pressure to sections of your feet? Reflexology is also used to balance health and prevent ailments. We will learn about the specific foot pressure points, how to apply the techniques to maintain good health, and relieve the symptoms accompanying an illness. In the Chinese tradition of reflexology, the study of feet pressure points has been used to treat, and as some believe, cure disease and pain. It is thought sections of the feet are directly linked to every part of the body. Referred to as acupoints, these spots are the same ones used in acupuncture. In this practice, the flow of energy, known as qi, connects our body parts to 15 points in our feet. In reflexology, the foot is marked in sections, and each foot is outlined for the corresponding side of the body (as shown in the foot pressure points chart above). For example, the left foot acupressure points are directly linked to the left side of our body, while the right foot focuses on the right side. Please note, some pressure points on each foot are the same while some points have different targets. Let’s look at the sections of the foot to understand the connection to our body. Head and neck are connected to the toes. The second and third toe are linked to your eyes, while the rest of the toes deal with your teeth, sinuses, and top of the head. For ear issues, the section just below the toes should be focused on. Spine is connected to the inside of the foot. Chest region is connected to the area under the toes on both feet. By applying pressure one inch below all toes (except for the big toe), you can reach the lungs. The heart point is two inches under the middle toe. Waistline is connected to the smallest width-part of the foot, near the center. The various organs and sections of our stomach can be linked to the areas above or below this region of the foot. Stomach is connected to the section below, or towards the toes on the center of the left foot. Just below is the left kidney, and to the right is your spleen. Liver is connected on the right foot, below waistline, and to the left of the center of foot. Your right kidney is left of the liver point. Intestines are connected to the section above the center of both feet, towards the heel. Pelvic region is connected to the bottom of both feet. Legs are connected to the heels. The pressure points of reflexology are expanded to different charts. The toe chart outlines five meridian points on each foot that relates to the body parts of the stomach, liver, gallbladder, bladder, and spleen. An outside chart refers to the top of the foot and the outside section of the foot. An inside chart refers to the inner side of the foot. Use this pressure point of LV3 to directly target headaches, menstrual pain, anger, anxiety, and stress. Locate it by placing fingers between the big toe and the second toe, where the tendons meet. Apply firm pressure and massage for four to five seconds. This is known as KD1 and targets insomnia, palpitations, memory loss, anxiety, hot flashes, and night sweats. Use your fingers to locate a depression at the bottom of the joint of the big toe. Move to the spot between the big toe and the second toe, and apply pressure with the thumb. Massage for two to three minutes. This LV1 point may help with stomach pain, hernias, and dizziness. It is located one inch below the toenail corner, on the inner side of the big toe. Apply firm pressure. This pressure point is used for abdominal issues such as stomach aches, vomiting, distention, and intestine infection, as well as fatigue, and memory and appetite loss. Use pressure along the foot to find the depression marking near the middle side of the foot, next to the ball of the foot. It is thought by applying pressure here, you may eliminate issues of arthritis, toothaches, sore throat, vomiting, lower backache, kidney disease, and respiratory problems like asthma and bronchitis. Firmly press on the spot between the Achilles tendon and the inner bump of the ankle. Reduce fear and anxiety, promote patience, and relieve cold symptoms with pressure to this point. You can easily find it by placing pressure on the bony bump on the outside of the ankle. Using this pressure point is thought to promote mental stability by improving mood and decreasing stress. Use the index finger and thumb to apply pressure to the area below the bone on the outside of the ankle. Treat intestinal problems, high blood pressure, vision issues, headaches, and lower back pain with pressure applied to this point. It is also used to promote circulation during labor pains and childbirth. It is located near the qui xu point, in the depression spot between the ankle and Achilles tendon. This is the point known to help with sinusitis, liver disease, vision issues, and leg cramps. Apply pressure with the index finger and thumb to the skin lying between the big toe and the second toe. This small section is effective for treating urinary tract infections and symptoms of food poisoning. It may also help toothaches, face and eye pain, constipation, and even stroke. Apply pressure to the spot between the second and third toes, on the bottom of the foot. Directly target diarrhea symptoms with pressure to this spot. Place fingers one inch below the adjoining skin portion on the big and second toes. Treat eye issues, lower back pain, mental stress, muscle cramping, and apoplexy. Apply pressure along the outer side of the foot to about one-third of the length to find this point. Target issues with high blood pressure with pressure to this point. Apply firm pressure with the thumb to the center portion of the big toe, above the middle joint of the toe for one to two minutes. Treat annoying hiccups and nausea, as well as increase appetite by massaging this pressure point. Find the spot on the second toe, just below the toenail. Use this pressure point to treat heartburn and constant burping. It can be found at the point below the toenail of the middle toe. Reflexology is just one of the number of therapies used by people to treat symptoms and diseases at their core. This tradition promotes health with the belief that body functions and processes are physically linked to certain pressure points. Let’s compare two common therapies with reflexology. Similar to reflexology, these therapies use points on the body to apply pressure to relieve various symptoms. Acupressure or acupuncture consists of more than 800 pressure points along 14 long energy lines throughout the body. Reflexology is focused on the body’s entire energy on each body part of the feet, hands, or outer ear. Regular massaging of the body and its target spots involves relaxing the muscles and soft tissue to help with symptoms. A massage can be done by using the hands and elbows in motions of tapping, kneading, stroking, and friction. Reflexology uses specific points on the feet, hands, or ears to target a specific symptom. Foot pressure points are thought to be the answer to resolving many symptoms, ailments, and diseases by those who follow and practice reflexology. Under this therapy, the sections of the feet are divided into correlating sections of the body. Depending on the symptom, each foot has a pressure point that focuses on a specific part of the body. This is done as a treatment, or to promote and maintain good health. “Acupressure Points And Massage Treatment,” Web MD, April 27, 2015; http://www.webmd.com/balance/guide/acupressure-points-and-massage-treatment#1, last accessed March 20, 2017. “Foot Pressure Points – Location Chart And How To Use Them,” Pain Care; http://www.paincare.org/foot-pressure-points-chart/, last accessed March 20, 2017. 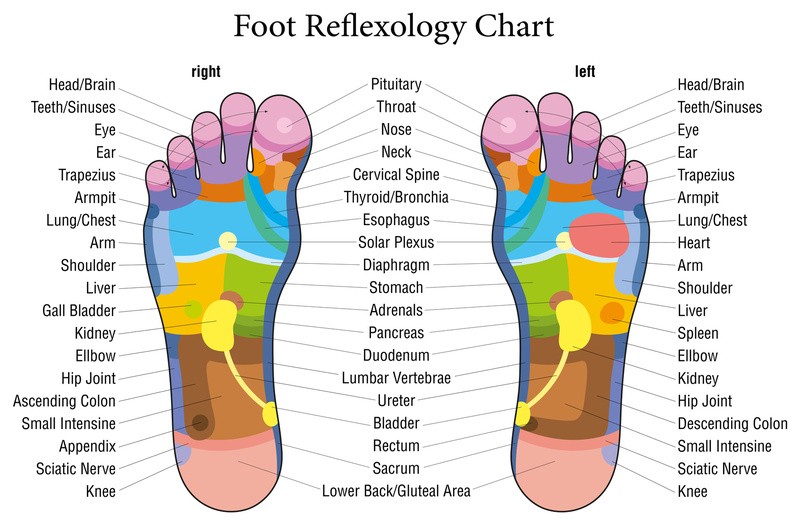 “Foot Reflexology Chart,” Power of Positivity; https://cdn.powerofpositivity.com/wp-content/uploads/2015/09/foot-reflexology-chart.jpg, last accessed March 20, 2017. “wikiHow To Read A Reflexology Chart,” wikiHow; http://www.wikihow.com/Read-a-Foot-Reflexology-Chart, last accessed March 20, 2017.